The best way to cover the whole city, see beautiful parks, learn about history, architecture and Czech culture! All the best places, stories, legends and curiosities of Prague in our Big All-in-One City Bike Tour! This is only possible only with our friendly and knowledgeable tour guides and on our quality city/mountain bikes. 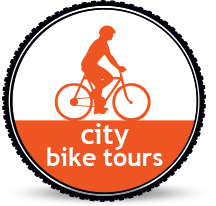 Big Bike Tour is the combination of our 2 tours: Panoramic & Castle Bike tour and Classic City Bike tour. We start our ride along the Vltava River, up to the most beautiful parks and panoramic vistas of Prague, visit Prague Castle and finish in the city centre, passing Old Town, Jewish quarter and stopping by some of the most important places and monuments like National Theater, Dancing House or John Lennon wall... The tour lasts about 7 hours and is divided in two parts with a 1,5 hour break for a traditional Czech lunch and relax time. If you want to see the best of Prague, learn about its fascinating history and experience an outdoor cycling adventure, our Big All-in-One Bike Tour is for you!